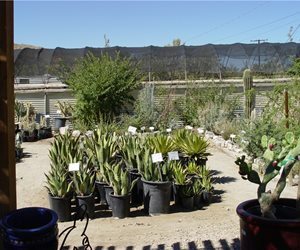 This species of Agave is shown here in 1, 5 and 15 gallon pots, each with a different price but all achieve the same size at maturity. 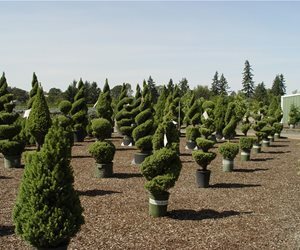 Specialty plants such as topiaries may cost more than the average container price due to the time and labor to achieve such precise forms. 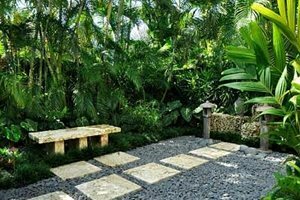 Just three tips can help you save thousands on your landscape project without sacrificing any of the design or beauty. The key is to know where to make the cuts that have the greatest impact on your bottom line. Every plant of the same species used in landscaping today will mature at a specific height and diameter. For example, a pin oak matures at 40 feet tall with a 25 foot diameter. 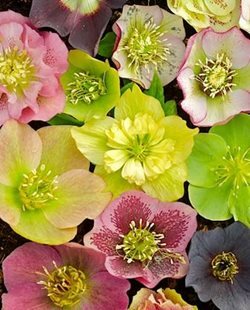 This is true whether you start it from seed or plant an expensive specimen for a small fortune. 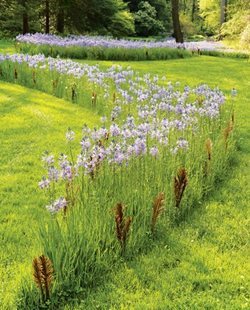 Big budget projects where instant landscapes are desired allow landscapers to buy plants from specimen growers who specialize in very large plant material with a price to match. Though their pin oak will be installed at a large size, yours will eventually reach the exact same size for a fraction of the price. Your designer produces a planting plan that shows the location of each and every plant that goes into your landscape. In the plant list she will specify the size of the container your contractor must buy for your project. Container size is how the industry prices nursery plants. The optimal size for a shrub on your planting plan is a 5 gallon container. Herbaceous perennials are 1 gallon containers. Trees are usually 15 gallon containers, but the next size up is considered specimen and grown in a 24 inch square wood box. The box sizes graduate up from there. Because all the plants achieve the same size at maturity, you can save money by planting smaller container sizes than those designated on the plan. 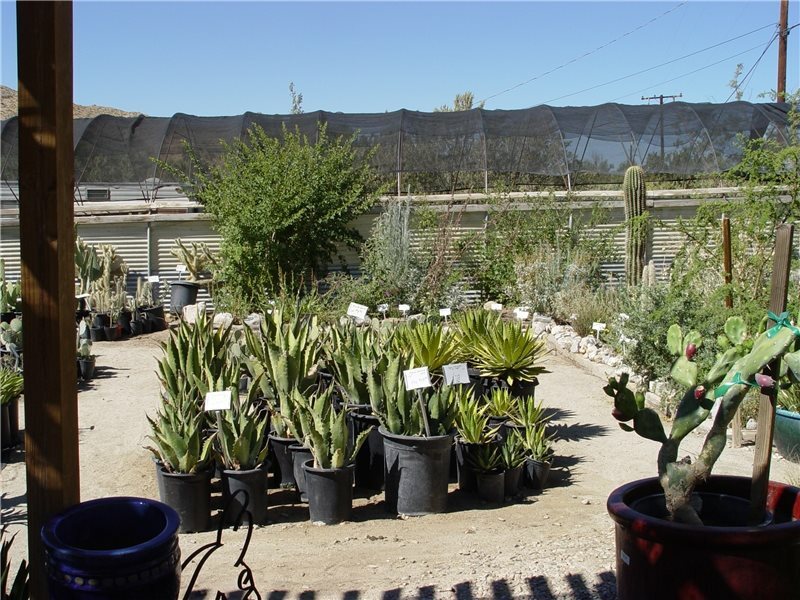 Do not reduce the number of plants because this negatively influences the design, just drop their purchase sizes. A 5 gallon shrub can be reduced to a 2 gallon, or even a 1 gallon, reducing its cost up to 50%. 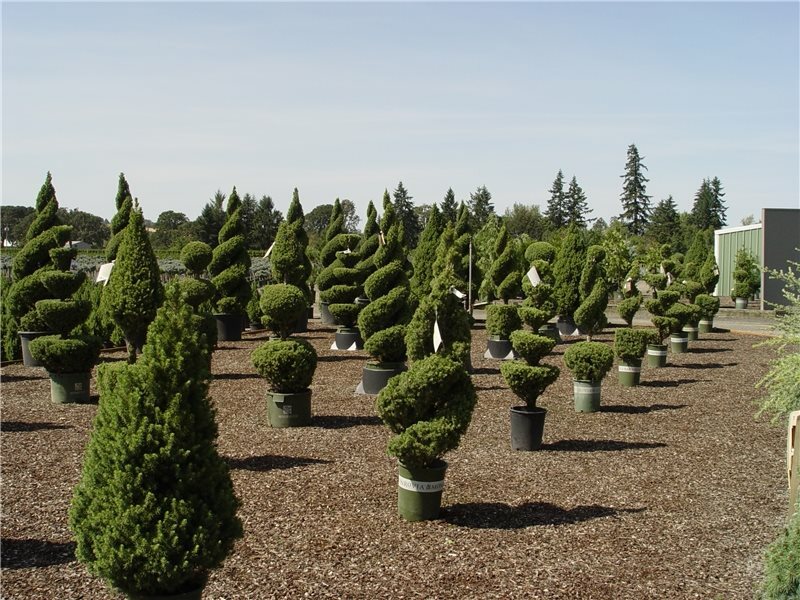 Though the labor charge to plant it is roughly the same, you save on the purchase price of that shrub, or perennial or tree. It's not always a good idea to apply this across the entire planting plan, however. Sometimes certain plants are sized for very important reason. 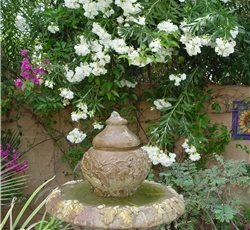 If there is a problem view or a need for privacy, shrubs for a screen hedge should be larger or specially trained to start in order to achieve this end as soon as possible. 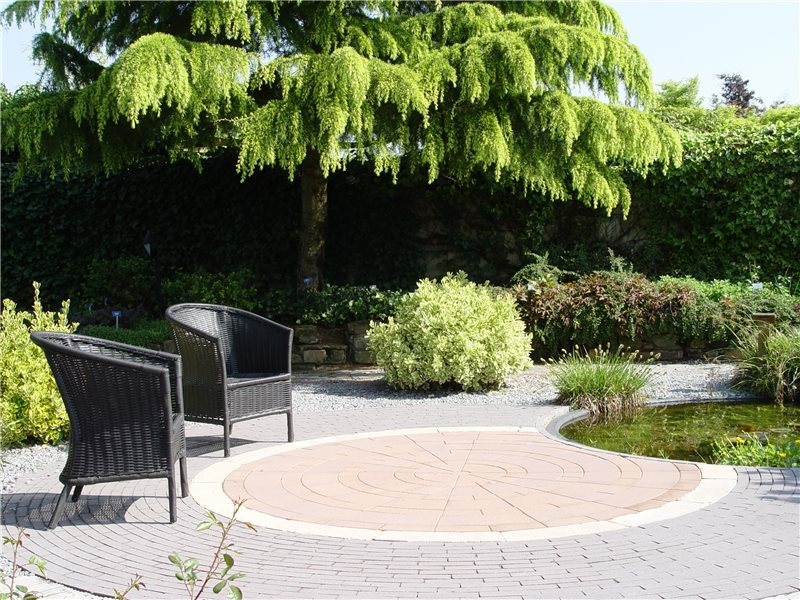 Similarly, if you are planning a big specimen tree to shade a patio so it is immediately usable, then this would not be a good choice for downsizing either. Note: Plant costs can vary by region and season of purchase. This outdoor living space saves money by reserving special paving for the seating area but it is linked to the rest of the garden by gravel paths. 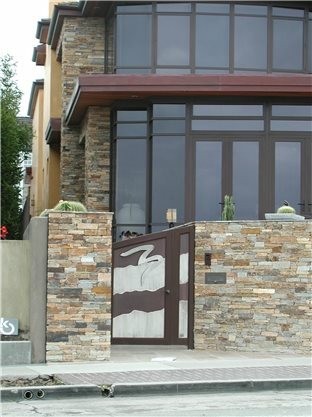 High end stack stone veneer is used at the entry wall of this home, but on the inside the wall is simply plastered like the neighboring wall at left. Tip #2. 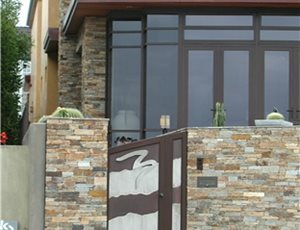 Vary hardscape material finishes. Anything built of concrete or masonry will demand a large share of your landscape budget. The most common examples are paving, walls or raised planters. The basic costs of a concrete slab or a block wall doesn't vary much, but the finish materials used can significantly increase costs. Often the materials such as stone finish over a slab offers a really high end look, but price is beyond the budget. Don't give up on your dreams if you can't afford that look because there is a strategy that allows you to save enough money to enjoy it where it matters. To better understand how to save, consider a movie set with one side detailed out to face the camera. Your landcape has a movie set side, which is determined by the most common or important vantage points. For example, the front entry or around the sliding door at the patio are viewed often and at short range. This is where you want to use your high end stone or tile for immediate impact. The edges of the movie set are still in camera range but not front and center. These are places where you can use a second class material that blends visually with the high end one, but costs considerably less. Their similar color or texture ensures that where the two materials intersect doesn't show much contrast. The third class locations are like the back of the set - purely functional and off camera altogether. These require masonry or paving but it's only seen by you, and even then it may be rarely. This would be a service porch off the kitchen, utility yard or a low wall to stabilize a slope along a sideyard. These may have some design characteristics such as color or hand textured concrete finishing, but that's still a very low end choice. Use this guide to select three types of materials for your project. Apply them to different parts of the site and you'll save enough to manage that high end look at high profile locations and still stay within your budget. 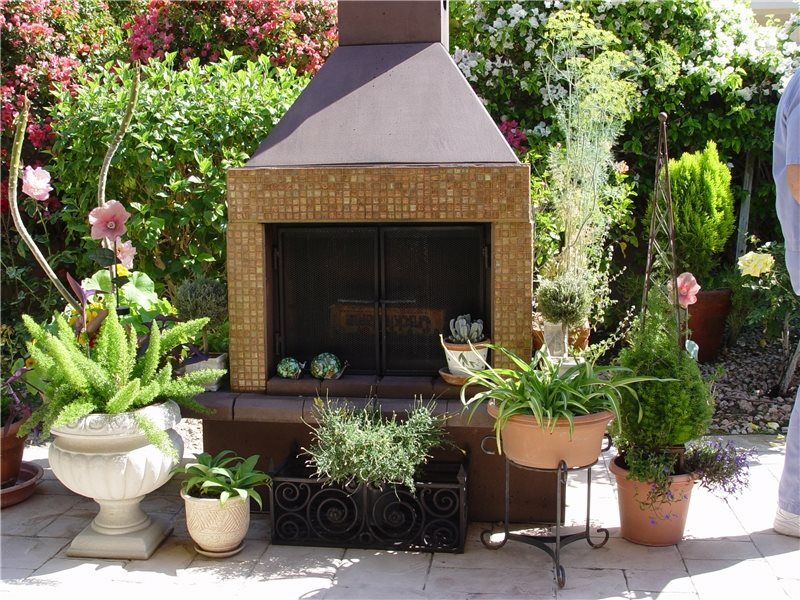 Big savings result when you use a prefabricated amenity such as this outdoor fireplace instead of a built-in one. 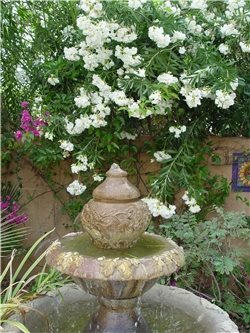 A built in fountain requires masonry, plumbing and electrical, but a plug and play package fountain brings water to the garden for a fraction of the cost. Tip #3 Avoid specialty construction. One of the best things about today's landscape industry is the growth of prefabricated amenities. These are factory made portable units that take the place of expensive onsite construction, offering enormous savings on both masonry and mechanical. The most well known innovation are plug-and-play fountains. Before them water features were strictly for the wealthy. Today you can buy whole outdoor kitchens made out of light-weight portable composites with the latest grilling features. These cost less than half the price of a built-in barbecue center, and you have much more flexibility with location. Because they are not constructed on site, they do not need building permits nor do they need to conform to building codes. Best of all they are immediately useful and don't require construction to install. 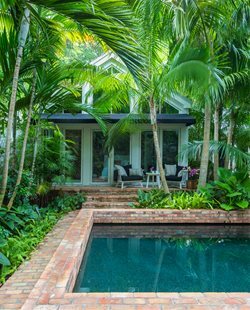 Whenever your project requires special detailed plans to create an amenity such as a fire feature, water feature or other outdoor entertainment units, inquire if there is a prefabricated alternative. One of the most popular are propane fired outdoor fireplaces which replace such costly built-in versions that in the past were restricted to very high end projects. This also applies to arbors, gateways and gazebos, which are now prefabricated in a wide variety of materials including wood, PVC plastics and metal. They are shipped as a package that your contractor assembles and installs. This is vastly less expensive than building such a structure from scratch. Best of all, you can select the style from a catalog, for more direct control on the look and feel of your project. 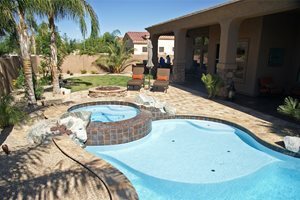 Hardscape: The portion of a landscape that is built such as paving, walls, decks, water features or a pool along with all the utilities associated with them.